Japan’s Yuzuru Hanyu performs his record-breaking Short Program at the 2015-16 ISU Grand Prix Final in Barcelona, Spain. The past few weeks have been very “meaningful” and “satisfying” for Japan’s Yuzuru Hanyu, who has won nearly every competition this season. Thus far, he has broken a total of ten world records. During the last week of November, the current Olympic champion demolished the world records of both the short and long programs with two close-to-perfect performances at 2015 NHK Trophy. 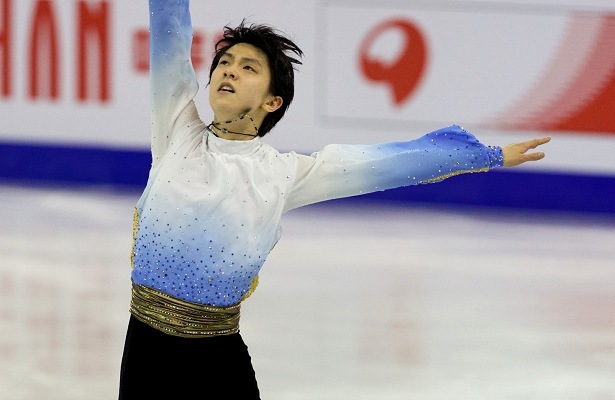 Two weeks later, he not only replicated the success, but further improved the quality of execution at the 2015-16 ISU Grand Prix Final (GPF) in Barcelona, Spain. As a result, he again bettered the world record scores and brought home his third consecutive GPF gold medal. Looking at the extraterrestrial scores he has recently produced, it is hard to believe that only a month ago the three-time GPF winner finished only sixth in short program segment at Skate Canada due to two invalid jumping passes which had no credit at all. However, that humble experience turned into the catalyst for the greater performances afterwards. The ambitious change was to upgrade the solo quadruple jump from a quad toe to a quad Salchow, and then upgrade the first jump of the combination from a triple Lutz to a quad toe. “By doing this, we can avoid what happened at Skate Canada,” Orser explained. Despite the fact that it was the first time for Hanyu to do a quad toe–triple toe combination in competition, as well as the first time he put a quad Salchow in the short, Hanyu has been extremely consistent with both—hardly missing any in either competitions or in official practices. The three-time Japanese national champion revealed the reason. As for the quad Salchow, which used to be his nemesis jump, his efforts in the past three years spent on the jump have not been wasted. The change was not only on the jumping passes, but on almost every element and transition. After training hard for a month, Yuzuru was surprised at how good the new program improved. However, after the new record score of 110.95 points achieved with this renewed short program in Barcelona, the skater felt extra pressure heading into the free skate despite a huge advantage. The skater from Sendai, Japan, started his free skate under the anxiety coming from his world record, as well as his teammate Javier Fernandez’s performance (201.43 points). However, Hanyu beautifully cleared one element after another, earning many level fours and positive grades of execution (GOE) along the way. He earned 219.48 for the long and 330.43 overall to blow away the competition, as well as achieving two new historical records. The “release” was also connected to the fact that the young champion did not have his best skates in the last Olympics. Hanyu once made a comment (after NHK Trophy) that he wanted to be an “absolute majesty” in men’s figure skating. In his mind, that means that he should not be influenced by external factors and nerves. The multiple world record holder also made it clear that what he tries to achieve in skating is not just about the scores. Moving forward in the Olympic cycle, Hanyu aims to defend his title in 2018 and plans to up the ante. For example, the skater wanted to add the quad loop he had been practicing for at least two years into his program this season, however, the landing is not yet ideal or consistent. While Hanyu plans to increase the level of his layout difficulty, he doesn’t feel that now is that time for that. The three-time Japanese champion will be in Sapporo, Japan, this week defending his national title. The skater admits that based on past experience, his “peaking” tends to calm down a bit during nationals, but as usual, he will give the best performances he can.